I found this blue lace weaver, Amaurobius similis, under a flagstone. Its eggs, wrapped on bright white silk, forming a semitransparent large egg sac, which she will guard until the spiderlings hatch. 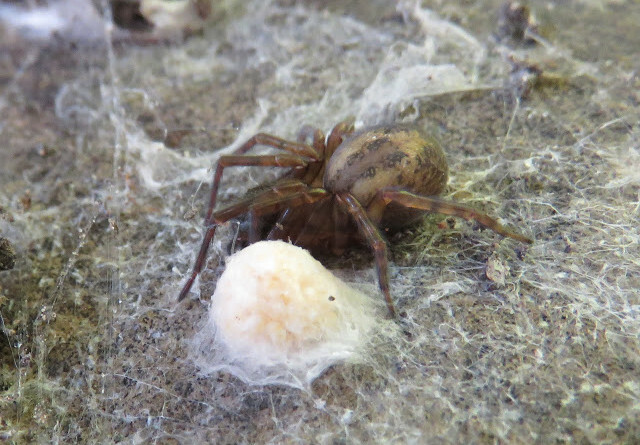 I have written previously on the extreme maternal behaviour of this spider, especially its production of a second batch of eggs for her first brood of spiderlings to feed on, and the matriphagous behaviour of her spiderligs. To read more click here.